April 1st marks the opening fishing day at most of the area Cooling Lakes around our house, sure makes my DH, boys and dog happy! Not to mention it gives me alot of uninterruped studio time. I do love to spend fish, but also enjoy the quiet time in my studio. 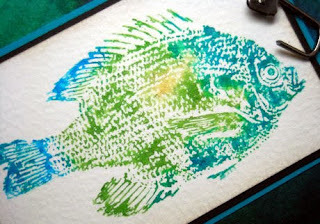 We do a lot of Bluegill fishing, or as my boys called them when they were little "bluegirl". 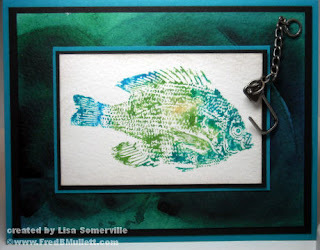 The Bluegill stamp is from Fred B Mullett (code FBM_158). If you haven't been to Fred's site lately, be sure to check it out, he's changed his cart to make shopping easier. You can always use the search feature to help you find what your looking for! I dusted off some of my neglected stamping supplied to create my card. The background using the Cling & Scrunch Technique from a past TJNL, I used Adirondack Color Wash Sprays in Denim and Bottle. To add color to the Bluegil, I used Radiant Rain Dabbers in Yellow Rose, Mallard Green and Majestic Blue. The do have a nice shimmer to them when dry. To create the hook, I simply snipped off part of the Swivel Clasp, then attached it to my card using Glue Dots. Just go fish! I love the Bluegirl, she is just fab, what an awesome stamp, all the details! Beautiful colors on that fish!! Love the colors of the stamping! Great job! FYI:: I do not like fishing--worms and scales on the fish...freak me out:) But....the good news is that I LOVE your card:) TFS! I like this card Lisa, especially the colours and the background. Fabulous. I'm lovin' that Fred Mullett fish. Nice work.